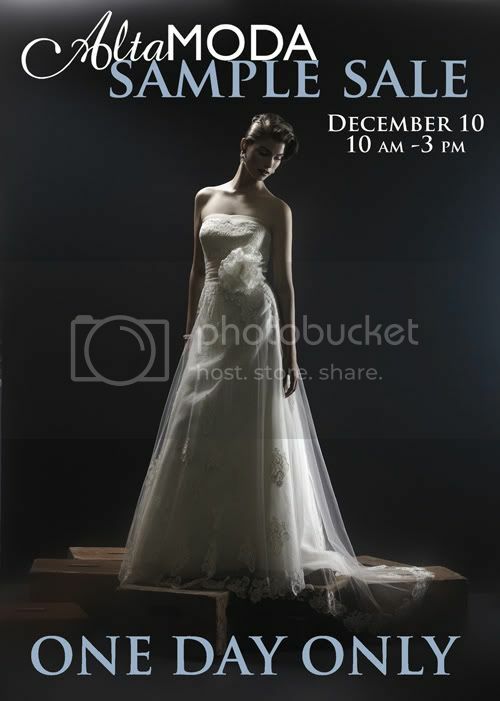 Rebekah Westover Photography: Alta Moda Sample Sale. Alta Moda bridal boutique will host their annual Sample Sale on Saturday, December 10, from 10 a.m. to 3 p.m. Brides-to-be are invited to line up early for a selection of more than 50 couture wedding dresses marked down 50 to 85 percent. Gowns start as low as $400, with many under $1000. There will be dresses from all of your favorite designers; Vera Wang, Monique Lhuillier, Anne Barge, Melissa Sweet, and many more. We love our gowns and treat them with the best of care, so you can be assured you are getting your dream dress at a coveted price. Want to know how sought-after this sale is? Last year, the Alta Moda staff arrived an hour early to find there were already a couple dozen brides lined-up outside the doors. That’s how much you need to be at this sale. Come early, wear a warm coat and bring hot cocoa or coffee to warm up with. Doors will open at exactly 10 a.m., and you’ll be welcomed into the shop to stay warm and cozy as you wait for your consultation. Once inside, your name will be put on a list in order of the line/arrival so you can find a seat and wait for your name to be called– no fuss, and no need to hold your place! Consultations will be limited to 40 minutes. We’ll be running many more fitting rooms than usual to help get you in your dream dress as quickly as we can. And just because it’s a sample sale, it doesn’t mean you’re on your own. You’ll each get an experienced consultant from start to finish. They know all the gowns (by name and inside and out), all the tricks, and how to make sure you are beyond thrilled. Only four gowns can be initially selected, but your consultant will guide you and make sure you try on the perfect styles until you find the one.